Little Bit Funky: big doings. or 26 times for that matter. 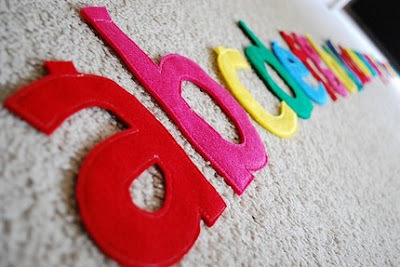 :) I just LOVE how this ABC banner turned out! And this one for another friend...do you know who? I just LOVE these letters...every single one is just SO darling! And my biggest accomplishment lately? Trying to replicate Doug's grandmas pot roast. Before this one the only red meat I had EVER cooked was hamburger. Seriously. I followed directions that Doug's mom gave me to the letter. Sounds like a success in my book. I LOVE the ABC banner! I am going to have to browse the shop! Thanks! hey! love the banner! where do you get your letter patterns from?? do you make them yourself?? or get them from a particular place?? 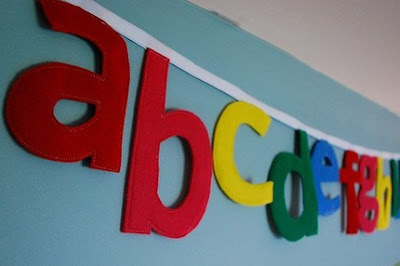 So, So, So excited to hang the ABC banner in AJ's room! I love all of your creations! The felt letters are F.A.B.!! Do you make them or buy them? oh my so cute. and that is so julie! darling stuff. I wish I could hire you to redo my mantle. Do you ever work in a more Mediteranean style/color scheme? ;-) Glad you had success with the pot roast. I know how that goes, exciting but nerve wracking when I tried to make my MIL's traditional Czeck meal. Love the letter banners! Like the others, I'm curious... did you have a pattern, or just make them yourself?? And please share how you made your gravy. Neither my husband or I can figure out how to make good gravy.